Overall, it was a very pleasant view. The hotel was great distance from Sea World and the San Diego Zoo (my destinations) and even some great downtown dining (Rock-in Baja Lobster). Only two downsides, traffic around the hotel is not pleasant during peak times especially if you want to get on the freeway, and the hotel has this weird ghetto feel to it. Closed down building next to the hotel, 50 people trying to squeeze into a 5 person spa. Great for social visitors, not so great for seclusive individuals. Love the wireless access and pet friendly environment; made my choice to stay here hands down easy. I really enjoyed the central location of this hotel to downtown, sea world and the zoo. All or our visits. Right across the bridge from a nice walk. Traffic around the streets of the hotel is not for the impatient especially trying to get on the freeways. My husband and I were very happy with the hotel and the staff. The parking was a little cramped, but the room was clean and larger than expected. The staff was friendly and the continental breakfast was nice, as was the room it was served in. We would stay there again. It was close to the freeway and the breakfast was nice. We were right next to the laundry, so it was a little noisy. 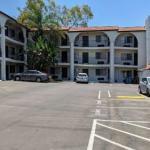 Nice clean rooms, the staff was very good, easy to find, good location to get around San Diego. Good for the price, very nice staff, good location. 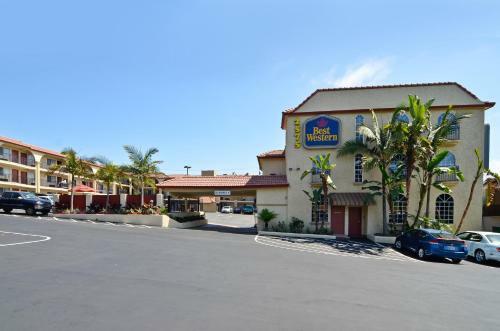 From Best Western Mission Bay Hotel will get you in minutes to San Diego´s main attractions: the Zoo, Balboa Park, Old Town and the beaches, you can always walk to Mission bay. The hotel take good care of business travelers offering them Best Western Business Plus rooms that include extra features to make their stay worry free. The extra friendly staff will answer all your questions to make your stay as smooth and fun! as possible. Business travelers will appreciate the desk area and the in-room high speed internet access. Fun travelers will also appreciate the free calls and the voice mail if making plans with new acquaintances for the day. The rooms include microwave and refrigerator. Prepare a nice cup of coffee if you decide to work overnight. A great plus is the hotel's continental breakfast. Spanish speakers will appreciate the Spanish speaking staff. Business travelers can use the fax and secretarial services as well as the free wireless high speed internet. Fun travelers can start the morning off with a splash in the outdoor heated pool or at the heated spa. Children under 17, yes 17, don´t pay if traveling with a paying adult. Good location with great freeway access. Rooms are clean and big with all the gadgets working. The staff is friendly and makes you feel at home. Two pluses: free parking and free breakfast. They accept pets. It is a good option for the price, the hotel meets all the needs of the not too demanding guest. Parking: Yes, there is parking.